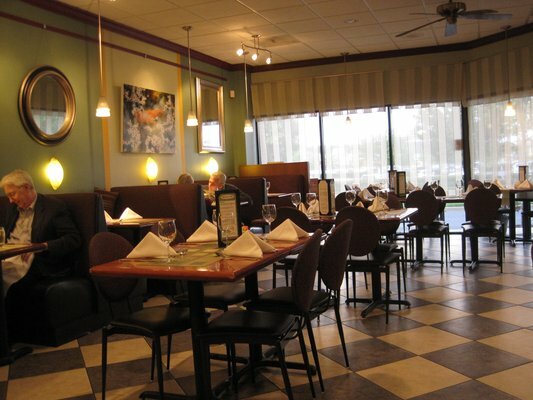 Mosaic Cuisine & Café, nestled on the busy side street next to Congressional Plaza, is somewhat of a sleeper. It doesn’t immediately come to mind when I need somewhere nearby to dine with girlfriends. But when it does eventually emerge as an option, I feel like slapping myself on the side of my head. It’s reliable, consistent, and comfortable. But what distinguishes Mosaic from its neighbors is one single item….waffles. In this case waffles are not simply relegated to the role of a breakfast dish (although Mosaic is a popular brunch spot). Here it is a delightful vehicle for a sandwich, or as an accompaniment to a salad or entrée. Chef Thierry Jugnet comes to Mosiac by way of France, where he has worked under famed chef’s Paul Bocuse and Alain Chapel, as well as DC’s own Yannick Cam. In a Washington Post review, Chef Jugnet is quoted as saying, “I was shocked when I came to this country to see how the waffles were made. I didn’t like what I saw. I wanted waffles from home. So first it was desire. Then it became a passion. Then it became an obsession.” Chef Jugnet’s obsession is good news for the rest of us. A girl’s night out often means salad as main course, and my recent visit is no exception. 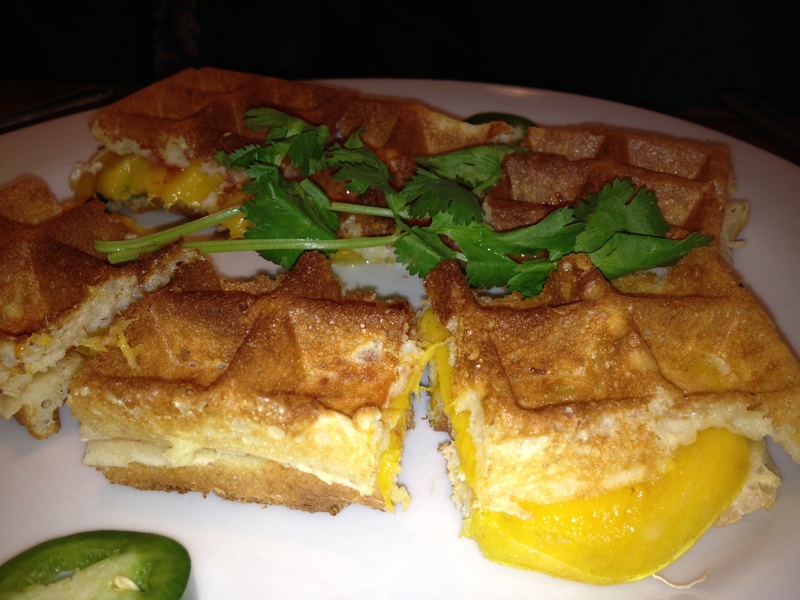 But happily we agree to share a waffle with mango, French brie, and spicy red berry jam. The melted brie is a soft and gentle companion to the ripe and juicy mango slices. It takes just a moment for the flavor of the sweet and mildly hot berry jam to seep through. A waffle doesn’t always maintain its crunch when topped with layers of gooey ingredients. But Chef Jugnet’s work has paid off, and his thick and crispy waffle doesn’t melt under pressure. Voila….this is what makes Mosaic Cuisine & Café special. I am not usually a creature of habit when it comes to dining. But I don’t need to ponder my decisions when choosing a salad at Mosaic. 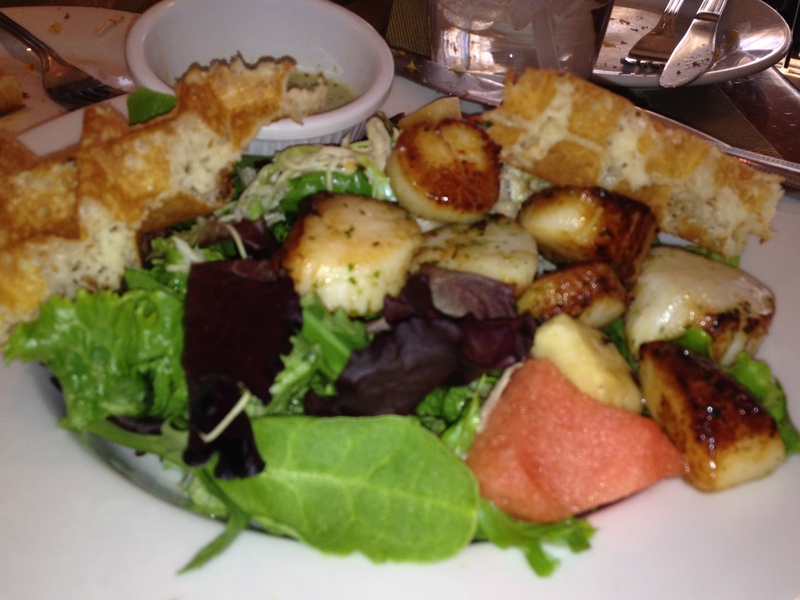 I can’t seem to steer away from the seared marinated scallop salad. I know that this tried and true dish will satisfy my desire for something light yet packed with flavor. The scallops are sweet and tender and the sesame lime dressing is cool and refreshing. An extra bonus- waffle triangles on the side of the plate! In dining at Mosaic on this particular evening, we are patronizing Dining Out for Life, which is a fundraising event for AIDS service organizations. Participating restaurants donate a portion of their revenue to the cause. Others here are clearly doing the same, and the restaurant is jammed. The staff doesn’t miss a beat when it comes to service. Various employees stop by our table with big smiles on their faces, making certain we have everything that we need. Admittedly, I have never tried the main courses after multiple visits to Mosaic. Steak with pomme frites appear on more than one nearby table, and look well worth a visit in the very near future. I also have my eye on roasted salmon filet with grape salsa, jasmine rice pudding, and steamed vegetables. Mosaic has a pleasing atmosphere with deep green walls, soothing lighting, and a contemporary feel. It really is a perfect neighborhood spot. My friends and I leave vowing to head back soon. I am confident that it’s now in the forefront of my mind for future reference. A few days later I am at a catered lunch at a friend’s house. Perched on the counter is an entire plate of familiar-looking waffle sandwiches. I squeal with delight, nearly certain where these have come from. Indeed the entire luncheon is catered by Mosaic Cuisine & Cafe. 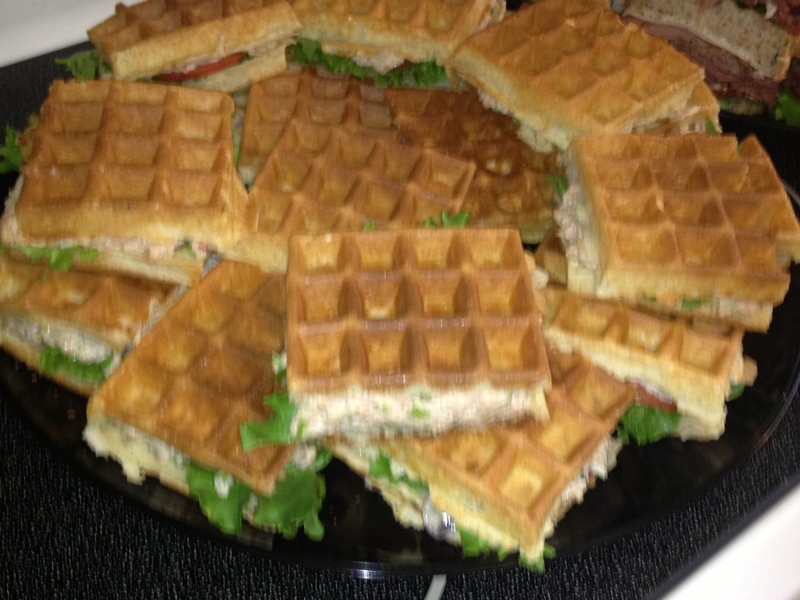 I’m surprised that the waffle sandwiches have held up so well, considering they are at least an hour old. I am told that Chef’s secret for catering is over-cooking them a touch so that they don’t get soggy. It works! A finely shredded ginger cabbage slaw makes a bright and tangy accompaniment to the waffle sandwiches. Waffles are Mosaic’s expected star but the cookies are not to be overlooked. I can’t decide if I prefer the oatmeal with cranberry or the chocolate chunk, so I steal multiple bites of both to make sure I’ve judged them fairly. Ultimately, I decide they are equally deserving of high praise. They are soft and chewy and rich. Others around me are equally impressed. I always enjoyed dining at Mosaic Cuisine & Café, but it’s the catering that really made an indelible impression regarding the overall quality of the food. I will no longer waffle when trying to determine where to eat in the Rockville Pike Area. I’m heading to Mosaic.